Canto Ostinato can be performed in a variety of combinations of keyboard instruments e.g. four pianos. The composition finds its origin in a traditional source. It is tonal and uses functional harmonies. Although all parts have their own fixed place during the performance and cannot be exchanged, neither the beginning nor the end as limits of form, have any absolute significance. Cause and result, tension and relaxation, as inseparable functional pairs become independent and are halted in the sequence by repetition. Chords or groups of chords, enclosed in bars and sections, are loosened from the melodic link and start leading a life of their own. Time is an important element. The bars or sections get a repeat mark and the performers must decide themselves on the number of repeats. This repeat procedure is aimed at the creation of a situation in which the musical object confirms its independence and can search for the most favourable position regarding the light. Time turns into space in which the musical object starts to hover. Quality is a difficult concept to objectify. Criteria such as workmanship, authenticity or originality are difficult to use, let alone be maintained. It is, however, possible to formulate some directions in the spirit of the composer. 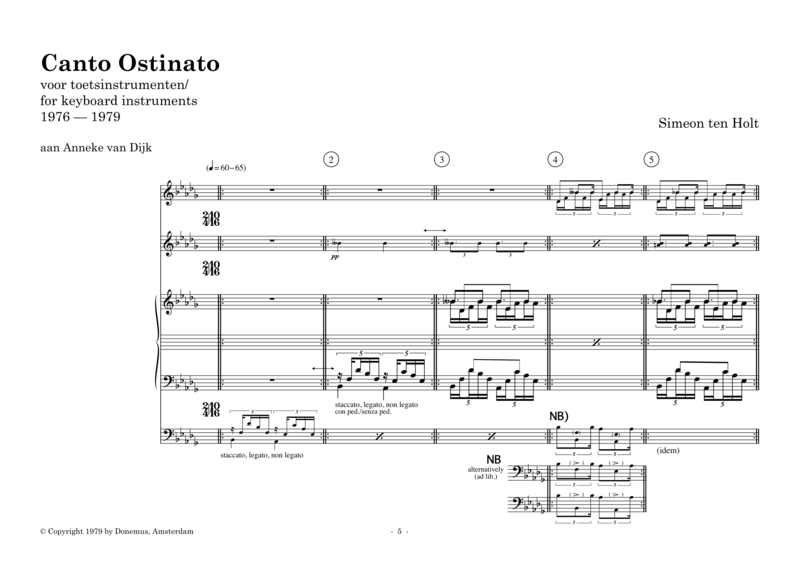 Canto Ostinato has been created and is meant as an ‘open scenario’ for key instruments. Various degrees of freedom have been included. Not only in the number of repetitions, but also regarding accent shifts and dynamic contrasts. The composer, however, had in mind that there should be some rules that limit this freedom. Everything is possible: playing melodic sequences higher or lower and creating dynamic contrast, but inventing new notes oneself is definitely out of the question. In 1999 Ten Holt said about Canto Ostinato: ‘My own idea about the ideal performance is not per definition the only right one. You can say though, that the composition arises from nothingness and that its creation takes place along gradual lines. Canto Ostinato, as it were, creates itself. Canto Ostinato seems to come into its own when played on key instruments. There are recordings of the composition performed by other instruments in various combinations. Some of these performances were appreciated by the composer, such as the performance by the harpist Assia Cunego. Starting point and touch stone remain the pursuit of a high quality performance that justifies the intentions of the composer. There are many recordings of Canto Ostinato, performed by several ensembles, all with different strength. A number of solo performances is also available. The Foundation welcomes the fact that many musicians are busy performing and recording the compositions of Simeon ten Holt. During his lifetime the composer often witnessed the rehearsals. The Foundation warmly advises musicians to get in touch with performers who have gathered some experience over the years with Simeon ten Holt’s compositions and who have worked together with him. Knowledge about his intentions and his wishes can be transferred in that way.